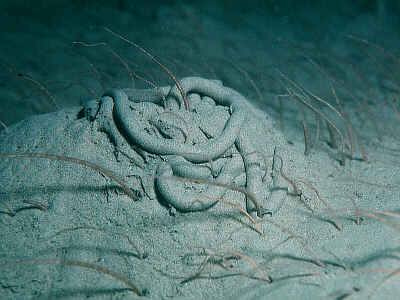 Description: A small brittle star with very long arms which lives buried in muddy sand. The dorsal side of the disc is covered with fine scales but the ventral side is naked. There are 5-7 arm spines, the second from below is flattened and axe-shaped. There are no tentacle scales. Disc 8mm. arms 10x disc diameter. Habitat: This species lives buried in fine muddy sand and extends its arms vertically 3-4cm into the water current, in contrast with Amphiura chiajei which is often found with this species but deposit feeds instead. Distribution: Found all round the British Isles, mostly in depths greater than 5 metres. Similar Species: Other Amphiura species are similar. See remarks under Amphiura chiajei. Small disc and long coiled arms. Buried in mud or fine sand. Underside of disc naked, upperside covered with fine scales. Second arm spine in each group is axe-shaped. Picton, B.E. & Morrow, C.C. (2016). Amphiura filiformis (O F Müller, 1776). [In] Encyclopedia of Marine Life of Britain and Ireland.